Freshmen at North Carolina aren’t expected to contribute very much. They’re supposed to cut their teeth and slowly earn trust and playing time. These aren’t your typical North Carolina freshmen. At least, they didn’t look like ones at the end of the first half on Monday, as Coby White, Nassir Little and Leaky Black sparked a 20-0 run to blow the No. 11 Tar Heels’ 103-82 win over No. 10 Virginia Tech (15-3, 4-2 ACC) wide open. It started when White drained a pair of threes to give UNC (15-4, 5-1 ACC) its first lead of the game against the Hokies, one of those coming from an assist from Black. Minutes later, with the Tar Heels up 36-29 and clicking, Black forced a steal in the defensive post and 11 seconds later, White drained his third three of the game. In the 11 seconds between steal and score, the three freshmen passed only to each other, running a three-man weave that could have come straight from a dry erase board in their shared dorm room. In all, White, Little and Black scored for 14 of UNC’s 20 points during the run. Cam Johnson and Garrison Brooks, who joined the three youngsters, each added three — with Johnson’s triple thanks to an assist from Little. The only time none of the freshmen were involved in a score was Brooks’ and-one basket which brought the Dean Dome crowd to its feet and prompted White and Little to literally jump for joy behind the play. The three freshmen brought the Tar Heels a youthful energy during that critical run on Monday night, while still maintaining the poise and defensive intensity that Roy Williams demands from his team. The key to UNC’s run was holding the Hokies without a score for nearly five full minutes while forcing three turnovers in the process. After a tip-in from Kerry Blackshear ended the run at 20-0, the Tar Heels headed to the locker room with a 45-31 halftime lead and a clear vision of what their freshmen could do. “For them to step in and basically lead that run tells you how good they will be and how good they can be,” said senior guard Kenny Williams after the game. Williams especially highlighted the added aggression he saw from Little, who was tentative in his first three games of conference play — tallying just 14 points over the three-game stretch. Little started to turned his game around with 11 points against Notre Dame and 12 at Miami, but on Monday he showed why he’s the highest-rated recruit Carolina has seen since Harrison Barnes in the class of 2010. Little topped his previous career high with 23 points on 7-of-12 shooting while adding six rebounds and three assists too. 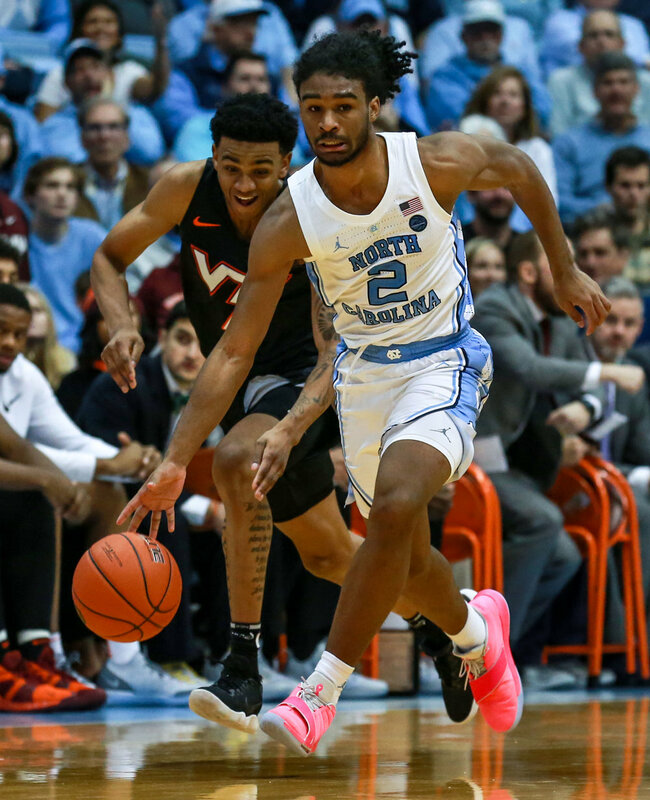 The only person to outdo Little on Monday was his roommate, Coby White, who scored a team-high 27 points thanks to five made threes and tallied six assists, seven rebounds and four steals. White became the first Tar Heel since Joseph Forte in 2001 to lead the team in points, rebounds, assists and steals in the same game. Adding in Black’s first-half three, the Tar Heels’ freshmen scored 53 of the team’s 103 points on Monday. Little said they finally showed what the trio of freshmen came to Chapel Hill to achieve, while White called that 20-0 run the most fun he’s had on the court so far at UNC. White, Little and Black all share a dorm room on campus, where Black said they have frequent meetings to discuss adjusting to campus life and big time college basketball. That relationship is critical for all three as they support each other on and off the court. And while senior leaders Williams, Johnson and Luke Maye go about their business and teach the young guys about the ACC grind, those three roommates bring a vibrancy and flair that could ultimately bring this Tar Heels team to another level. “It felt good to have that swagger about us,” Nassir Little said. UNC men’s basketball rode a 20-2 run and a Roy Williams era record 16 three-pointers to a 103-82 victory of the visiting No. 10 Virginia Tech Hokies on Monday Night.